Mt. Cuba Center will offer a limited number of high-quality native plants for sale beginning at the botanic garden’s annual Wildflower Celebration, to be held Sunday, April 28. The plants will also be available to visitors on any day the gardens are open to the public, while supplies last. Using native plants is one of the best ways to support wildlife and ecosystem health. Mt. Cuba Center will offer these plants in response to guest requests, and because master plan-guided upgrades to the garden’s greenhouse complex have significantly reduced the capacity to grow plants for previous years’ giveaway program. The plants will be sold where tickets are, including, at times, the Main House front desk or in the guest parking lot. The cost is $6 per plant. Each plant comes in a 4.5-inch pot, slightly larger than for past giveaways. There will be a limit of one tray per person. Guests may also purchase plants without visiting the gardens or paying admission. Season passholders will still receive one giveaway plant. Northern barren strawberry (Geum fragarioides): This semi-evergreen groundcover has the strawberry’s dark green foliage and yellow flowers. It’s a hardy perennial that grows three to six inches tall, tolerates partial sun to light shade and succeeds in a variety of well-drained soil types. Northern barren strawberry works well as a groundcover. 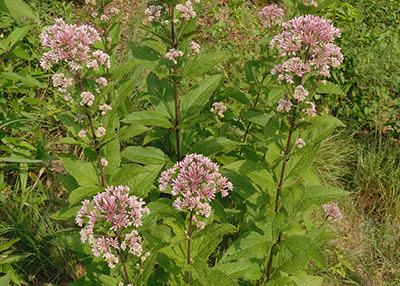 Little Joe Joe Pye weed (Eutrochium dubium ‘Little Joe’): This herbaceous, flowering perennial in the sunflower family is the tallest of the three spring plants, growing three to four feet tall. 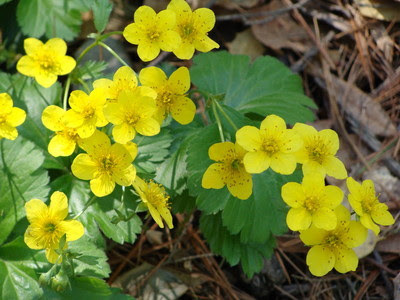 It grows in full sun to part shade, and because it needs soil that doesn’t dry out it is sometimes used in rain gardens. Little Joe Joe Pye weed attracts butterflies and thrives in bright sunlight. 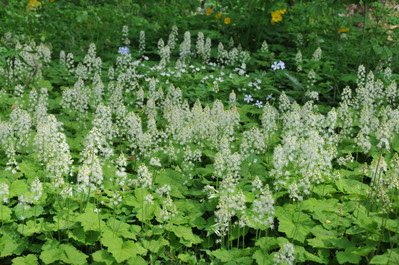 Brandywine foamflower (Tiarella cordifolia ‘Brandywine’): This perennial spreads rapidly from runners to form dense clumps of four-inch-wide, heart-shaped leaves. It’s grown in part to full shade in moisture-rich soils.